It’s hard to imagine an author whose work can genuinely be called an heir to Agatha Christie, but Iceland’s Ragnar Jonasson might be modern crime fiction’s strongest contender. In Jonasson’s newest Dark Iceland series installment, WHITEOUT, readers are treated to a Christmas-themed mystery that delivers all the atmosphere, intrigue, and charm that has made this series so popular. Jonasson’s books are not “cozy mysteries,” but they are the perfect choice for a cozy autumn or winter afternoon spent reading, and WHITEOUT is perfectly timed to the approaching holiday season. Readers of Agatha Christie will love the distinctly classic crime style of Jonasson’s writing, and will also be drawn to WHITEOUT for its quasi-“locked room mystery” structure—in this case, the “locked room” being a very small, very isolated little community in rural Iceland. Grab a cozy sweater and a cup of coffee and prepare to be drawn into Jonasson’s immersive and endearing mystery series. 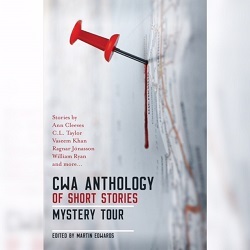 I've only recently begun to explore crime fiction short stories in earnest, so when the offer came around to participate in the blog tour for the newest CWA Anthology of Short Stories, I knew I had to jump at the chance! This fantastic short story collection is published by Orenda Books, and has a “Mystery Tour” theme, which means it highlights crime writers from around the world, writing stories set in countries from across the globe. I love to travel and I (clearly!) love crime fiction, so I couldn’t imagine a better theme for an anthology. I'm delighted to share my stop on the CWA Anthology of Short Stories blog tour today! I’m delighted to be on the blog tour today for the newest book from the King of Helsinki Noir, Antti Tuomainen! Tuomainen’s newest, THE MAN WHO DIED, is engaging and immersive; readers looking for a new crime read with a dash of dark humor and plenty of personality will find their perfect match in this Finnish crime novel. I’m not usually a reader who looks for humor in their crime fiction, but Tuomainen’s smart and poignant story delivered the perfect blend of thrills, investigation, character development, and comedy to keep me engaged from the first page to the last. THE MAN WHO DIED is yet another example of publisher Orenda Books’ sharp eye for unique, original crime fiction; it’s smart, sensitive, and engaging, and guaranteed to be unlike anything else in your crime fiction library. Some books seem to defy categorization and expectation entirely—Louise Beech’s MARIA IN THE MOON is that kind of read. Releasing from Orenda Books on September 30th, this enchanting and brooding story managed to captivate me, unsettle me, and keep me fully immersed from the first page to the last. I’m delighted to participate in the blog tour for this stunning novel today! Whatever your expectation for this story might be, MARIA IN THE MOON is likely to surprise you; this book is neither crime fiction nor literary fiction, it’s neither terribly dark nor is it wholly uplifting. What it is is honest: Beech’s writing feels raw, as though the reader is privy to the author’s innermost self, laid bare on the page. MARIA IN THE MOON is a beautifully-constructed and wholly transporting novel, one that draws readers into a young woman’s search for her own memories—a search which reveals truths she has long since hidden from herself. THE OTHER TWIN by L.V. Hay is aptly titled: this book has two identities. On the one hand, this book is an inventive, addictive psychological thriller for the social media age—a binge-worthy story that considers the secrets we can hide online. On the other hand, this book is an unflinching and heartbreaking glimpse into the damage we can inflict on one another when we impose our own worldviews on those around us. As much a call for acceptance as it is an addictive thriller, THE OTHER TWIN will surprise readers with the substantial message that lies underneath its engaging and binge-worthy plot.